Will RBA Drive AUDJPY to 85? 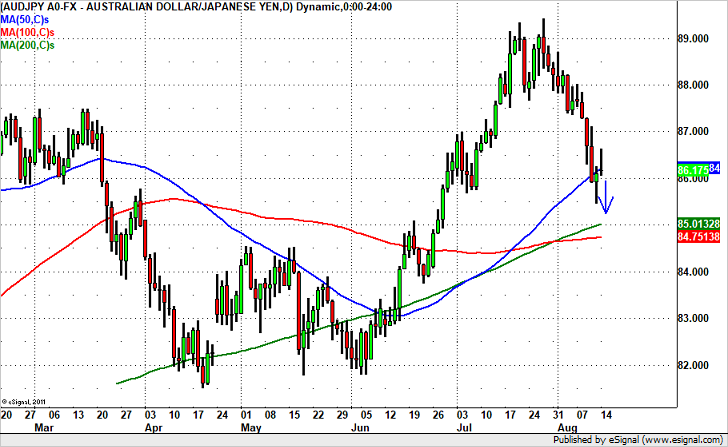 While we still like selling USD/JPY, we see a better opportunity in the Australian dollar. Last night’s weaker than expected Chinese industrial production and retail sales numbers reminded investors about the trouble in the region. Tonight, the minutes from the last RBA meeting are scheduled for release and we believe they will echo the cautious view presented by RBA Governor Lowe after the last meeting. To the market’s surprise, the central bank cut their growth forecasts citing the negative impact on the stronger currency. RBA Governor Lowe warned that a continued rise in the AUD would depress prices and limit employment. We believe this same sentiment will ring throughout the minutes reminding investors of the recent strains on the economy and weighing on the Australian dollar. We like selling AUD versus the Yen because not only was Japanese GDP very strong but we still believe USD/JPY should be trading lower.